Higher Agricultural education is becoming increasingly important in sub-Saharan Africa. Providing a high quality higher education network that is reliable, secure, adaptable, scalable and fault tolerant has become fundamental in higher education. Higher education institutions’ access to networks is therefore critical in supporting the core mission of training, research and innovation. Networks and innovations are pivotal in enhancing reputation, competitiveness, client satisfaction, revenue, and accountability. Consequently, networking capabilities are now used in diverse and creative ways to facilitate strategic goals such as creating unique student learning environments, operating successful e-learning programs, leveraging early adoption of emerging or experimental technologies, providing life long link to alumni, enabling cutting edge research and commercilization of research innovations. This paper emphasizes the importance of improving networking and Innovation systems in Higher Agricultural institutions particularly in the areas of teaching, research and extension. A number of examples will be given based on Jomo Kenyatta University of Agriculture and Technology (JKUAT) experience. Networks in teaching: A great deal of energy and enthusiasm currently surrounds creating and/or joining education and research networks due to the significant increase in the demand for higher education in the last two decades. For instance, in Kenya the number of public universities have grown from 7 in 2010 to 32 in 2014. At the state and regional level, JKUAT alone has 7 campuses and centres in Kenya, and regional campuses in Arusha, Tanzania; Kaduna, Nigeria; and Kigali, Rwanda. JKUAT is extending its networks to South Sudan and Somalia Republic. This calls for a model of moving toward a regional facility based network. These regional networks provide JKUAT with connectivity to external networks. It is in the same spirit that JKUAT hosts a RUFORUM funded MSc in Research Methods and PhD in Food Science and Technology. ANAFE has developed an innovative agribusiness curriculum which is being piloted in a number of universities in Sub-Saharan Africa. In Kenya the program is being piloted at Rongo University College, University of Eldoret, Taita Taveta University College and JKUAT. From the experience of ANAFE activities in UniBRAIN tracer studies, revision of agricultural programs and imparting soft skills to students have a significant role in enhancing the entrepreneurial and practical skills of the students. Such regional programs are a catalyst to greater staff and student mobility as well as internationalization and/or harmonization of curricula. The INTRA ACP Academic staff and student exchange program, which builds on the African Union’s Mwalimu Nyerere programme for Africa, is based on this concept. In this Programme JKUAT is a partner in Agriculture and Engineering projects which includes more than 20 Universities in African. Over a hundred student and staff are currently participating in this program. A good example of networking for teaching is the Pan African University (PAU) initiative. This network has 5 critical thematic areas for Africa’s development namely: Basic Sciences, Technology and Innovation at JKUAT, Kenya; Water and Energy Sciences (including Climate Change) in Algeria; Governance Humanities and Social Sciences Yaounde II, Cameroon; Life and Earth Sciences, University of Ibadan in Nigeria; and Space Sciences. 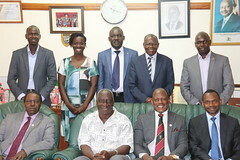 Another example of a teaching network is the Inter University Council For East Africa (IUCEA) which is leading in harmonising standards for quality assurance of academic programmes. Innovations in teaching: In teaching, scientific and technological innovation will continue to play an important role in increasing productivity and efficiency beyond the traditional classroom delivery mechanisms. ICT has consistently driven remarkable changes in the education system among many other sectors. It is a mode that has a high potential for transcending barriers that are caused by distance, time, and age; thus facilitating lifelong learning. Through distance education the learner enjoys a high degree of autonomy in deciding what, when and how to learn. Today, distance education programmes are able to make full use of information and communication technology through the application of a wide range of media: print, audio-visual, CD-ROM, computers and the Internet. The operation of existing and new university networks for teaching can be simplified further using ICT. Other innovative approaches include harmonized teaching curricula, credit transfer systems and flexible learning methods. Imparting enterpreneurial skills to all students is increasingly becoming integral in university education. This targets shifting the mentality of students from being employed to becoming employers. It is in this respect that JKUAT started the Department of Agricultural Resource Economics to complement other Faculty of Agriculture programs. Agriculture ought to have a lucrative image. Agricultural programs in institutions of higher learning should attract the best students, and the graduates should be well equipped to stimulate increased production of food and non-food agricultural produce, maximize prevention of postharvest losses, enhance the nutritional value of foods and food products, assure food quality and safety, and ensure good returns for all players in the sector. Africa continues to be Food and Nutrition insecure despite concerted efforts from governments and the donor community. Cutting edge research on increasing crop production and productivity has received much attention. However, postharvest losses of agricultural produce is still in the range of 30-50%, particularly in fruits and vegetables. Processing and value addition of agricultural raw materials is still at its infancy, and where it exists, the quality and standard of the finished product cannot compete in the international markets. More agonisingly, African governments still have very low budget allocation to agriculture and agro-processing. Under these circumstances, networks can be instrumental in mobilizing research funds and in exploiting the existing expertise in agricultural sciences. A good example of a research network is the Bill and Melinda Gates Foundation funded -Agricultural Research Connections (ARC) which brings together scientists from all over the world to deliberate on Food and Nutrition Security issues and to write research proposals. Transboundary and multidisciplinary research themes in water and irrigation, climate smart crops, provision of high yielding clean seeds for all the common staples, postharvest handling and processing of fresh produce, innovative packaging technologies, by product utilization streams to create more wealth as well as clean energy production systems are needed. In all these cases, identification of the main gaps in agricultural value chains is critical for agribusiness innovations and increased markets. Trade data from four most significant economies in the world (Brazil, Russia, India, China and South Africa; “BRICS”) show that these countries have become more active in mechanization of agriculture, value addition of raw materials and fabrication of appropriate machinery for value addition. In Africa, many of these equipment are imported at high cost which then acts as a barrier to value addition and industrilization. There is a need for Africa to borrow a leaf from the BRICS nations. Centres of excellence in research are needed in various region of the continent for example the BecA ILRI hub in Nairobi, which is a world class centre excellence in molecular science and biotechnology. There is need to avoid duplication of research efforts by strengthening mechanism for sharing lessons learnt in each research project and creating networks for catalyzing increased commercialization of research outputs. Commercilization of research outputs is still low in most Higher Education Institutions. This can be improved by sensitizing staff on Intellectual Property rights and patents. JKUAT has established an IP office to commercialize research innovations and the university has an IP policy that provides incentives that focus on excellence and relevance. Networks in Dissemination: It is not business as usual in African Universities any more. Universities must be seen to be relevant in offering practical solutions to existing community/industry problems. Agribusiness incubation has been adopted at JKUAT to support nascent graduate entrepreneurs to create new jobs. Through UniBRAIN (Universities Business and Research in Agricultural Innovations), a DANIDA funded project run under the leadership of FARA, the Sorghum Value Chain Development Consortium (SVCDC) has incubated 29 SMEs in the area of Food, Feed, Fuel and Fiber. Similar initiatives exist in Uganda on coffee and banana, fruits and vegetables in Zambia, Livestock products in Ghana and non-forest produce in Ghana. The initiative strives to create a one stop centre where all the incubatees needs can be addressed. JKUAT is the first university in Kenya to collaborate with private company in food production. The JKUAT-Nissin company, domiciled at the university, produces nutritious noodles which fit the palate of Kenyan. The raw material (sorghum and wheat) used in the manufacture of the noodles are locally sourced and the flavours have been Kenyanized (Nyama choma flavour, chicken flavour). Additionally, JKUAT is partnering with KEROCHE Foundation to support small scale entrepreneurs in value addition of agricultural produce. More recently, JKUAT is venturing on an Industrial Park which will focus on agro-processing, agromachinery and exploiting ICT tools in agriculture. Through the m-SHAMBA initiative, a mobile phone based marketing tool, farmers can now get information on the market of fresh produce and the respective prices within a tap of their mobile phones. There is a dire need to strengthen our networks to keep pace with the dynamic world. These are success stories forged on PPPs.